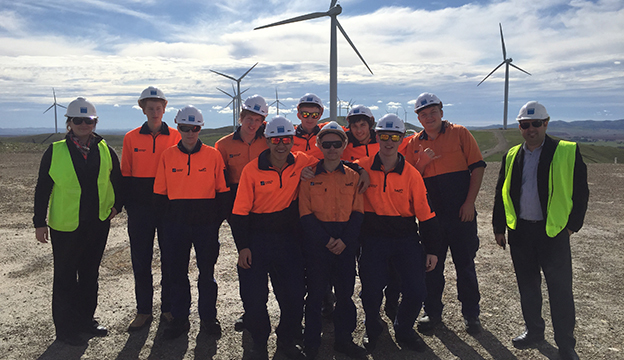 Today our Year 12 Electrotechnology class visited the AGL sites at the Burra Renewable Energy Centre and the wind farms in Hallett. Although a long drive, students enjoyed the day. We were blessed with great weather and breathtaking views on top of the Hallett site. We saw 34 turbines in operation and were able to look at monitoring equipment at the sub-station and were treated to presentations and tours by expert staff from AGL and Vestas. Showbags supplied to students were filled with valuable information for their assignments and for their personal interest as they being the transition from school to careers in the electrotechnology industry. Many thanks to Mr Michael Haddad for his expert driving skills and to Naomi, Yao, Rene and Hugh from AGL and Vestas for their time, effort and for sharing their knowledge and experience. Students really appreciated this amazing learning opportunity. This entry was posted in Latest News on 25/05/2015 by St Patrick's Technical College. As part of our Year 12 Community Studies course in 2015, student from the School of Community Studies, Hospitality & Lifestyle are striving to raise $1800 to package 600 birthing kits for the Australian Birthing Kit Foundation. Students will work together to create these basic birthing kits, which include a plastic sheet, soap, 2 gloves, sterile scalpel blade, 3 cords and 5 gauze squares. The kits will be sent to villages in Third World Countries where women are unable to give birth in sanitized areas. Students have been actively involved organizing events and raffles to raise money for this project; this year’s International Women’s Day Breakfast and Easter Stall at St Patrick’s to name a few. Working with Adrienne Williams from the ZONTA Club of Para District Area, students will host a Pamper Grandparents morning on Tuesday 2 June. The Club has generously contributed $350 towards the students quest to raise money. Last night, Millie Carmody and Shannon Chamberlain (pictured) attended the Biennium Dinner held at the Country Comfort Adelaide Manor to accept the generous donation on behalf of their class. Including this donation, the class has now raised $600 and will be working diligently together to raise an additional $1200 this term. This entry was posted in Community Blog, Latest News on 06/05/2015 by St Patrick's Technical College.